In the past 5-7 years, Skopje has experienced a huge construction boom, primarily in the residential sector. This has been both preceded and followed by a strong rise in house prices. The phenomenon has been limited to the capital city. The rest of the country, with minor exceptions, has had limited residential construction and house costs have remained stable. Price hikes have been especially visible in the 2007-2009 period when, according to estimates conducted by the National Bank, they have risen by over 35%. At present, an average price per square meter in Skopje stands at around 1.000 Euros. Prices can be fairly lower (700-800) in less attractive parts of town, and substantially higher (1.300 Eur and more) in the new elite neighborhoods. Recently, amidst increasing talks of a collapse of property market, prices seem to have decreased a little. The very few public surveys - in addition to the one regularly performed by the National Bank, there is a more recent semi-annual one conduced by a private consultancy (Forton) - indicate to a small decrease of around 3.5-5% of the residential square meter price in the past 6 months. The major issue is the demand. Or more specifically, the lack of demand. Over the past decade there has been a strong demand for houses in the capital - unfortunately there is no reliable public data on the exact number of flats sold - and this has boosted both prices and supply. Profits have, reportedly, become enormous. Both the private sector (builders) and the public one (municipalities issuing the building permits) have become feverish. Hundreds of new builders have sprung up. Authorities have started issuing licenses like mad. In the wider city center there is practically no room to swing a cat. The green has been eradicated, parks wiped out, ancient trees cut down (no one feels like protesting, however), pavements depleted. Buildings have started to be built one on top of another. Historic neighborhoods, such as Debar Maalo, once known for the old houses with gardens, have been clogged by new buildings. Streets have stayed small however, making traffic impossible and residents agitated. Suddenly however, it appears that demand has stopped. According to some estimates, demand has fallen by some 30% compared to last year. Even if the number is accurate, it only tells a part of the story as it is not put in relation with the output of new apartments. According to some data (credited to Forton), the number of new flats delivered in the first half of 2013 (around 1,800-1,900) is almost double than the number (est. 1,000) completed in the second half of 2012. An additional 1,000 houses should be completed by the end of the year, according to the same estimate. According to other estimates made publicly by senior officers in the banking sector, the source and the methodology for which have not been cited, there are around 4,000-5,000 new unsold flats in Skopje. The most recent Forton data again suggest that the vacancy (number of unsold flats) at delivery has increased over the last year and it now stands at 43%. In sum, people have stopped buying. Data is not clear because many builders are reluctant to share them. Whereas some of them can be more candid about the difficult situation, others hold to the appearances in an attempt to calm the market. The simplest of data such as flats sold monthly does not exist publicly. In the absence of clear data, one strong indicator is the media panic. The press is glutted with articles about the real estate market. Whereas some of the coverage warn of an imminent crash, others (likely sponsored) tell rosy stories warning about future price hike, trying to lure in buyers. Compared to 2-3 years ago, the amount of press coverage of the housing market has multiplied. There are other important indicators as well. About a year and half ago, the government launched a campaign trying to bring down house prices through increased building of public flats, sold at a subsidized but still a market rate. No one said it out loud. The declared goal of the campaign was to help young people get a home. But it seems the government was worried about the overheated market. Another indicator is the number of bad loans which has been rising. There is no clear data on the sectoral breakdown of the bad loans, but it is a fair assumption that many are in construction. Banks have been increasingly foreclosing on builders who cannot repay the loans, (again no specific data available publicly) and they have amassed a lot of real estate. However, they apparently cannot sell it. There has been quite a lot of “negative” press of banks not wanting to lower the prices of their new “assets”. A few months back the National Bank has decided to gradually (20% per year) write off the real estate assets on bank accounts. This means that bank real estate property would have to be completely written off over a 5 year period. The decision is an attempt to bring order in banks' balance sheets. Whereas banks report profits, it appears that this is in assets that they cannot actually sell. In other words, it is likely that some of the banks could be in it over their heads as well. Some bank managers have issued warnings about the situation. Unless prices go down, they say, the market is facing collapse. Constructors will not be able to sell houses and repay their loans. Many builders on the other hand argue that for them price reduction is not an option, as they have been building with expensive inputs. The rising panic obviously further depresses demand. Buyers wait to see if prices will go down. It is clear that a lot of the excess of demand (accumulated over the longterm) that originally boosted the supply has been absorbed by the market. The heightened expectation now deters even the much smaller regular demand. Prices should be expected to go down the same way they exuberantly went up 4-5 years ago. However, they often do not start declining until it is too late. When the crisis has spread through a range of other industries pulled by construction. The situation is very similar to to how the crisis started in quite a few other countries, most recently Spain. The overheated real estate market started cracking for the lack of demand, dragging down banks. This slowed down the entire economy. The question now is: how hard will the landing be? In a small market like Macedonia, a bubble may not go into a full burst, but its prolonged deflation will be as detrimental. 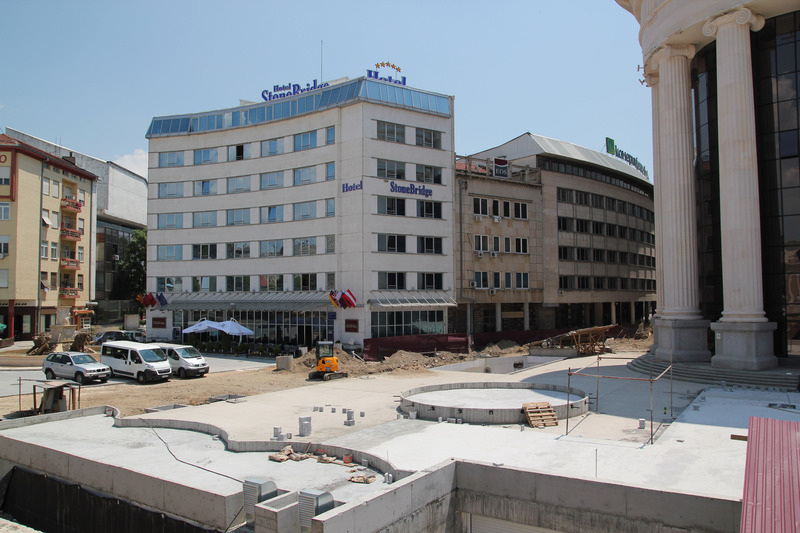 Macedonia's modest growth over the past years, which was nevertheless halted by the global crisis, was to a large extent driven by the runaway construction sector. With the sector now facing collapse, the country is looking ahead to a new recession. And likely a deeper one.